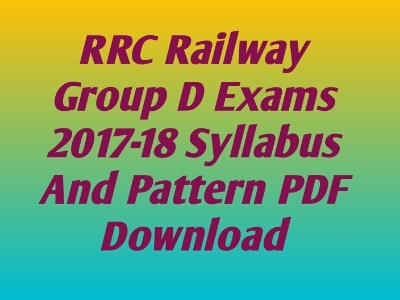 RRC Railway Group D Examination Pattern and Syllabus 2017-18 pdf file download Provided here. You can download RRC Railway Examination syllabus below on our site. Hope, you are quite well and daily practice for railway examination. Railway examination is most important for you because railway is the biggest sector of India. Every year Recruitment all over India on various post and vacancies. This is the great opportunity for you. The various post is available on Railway Examination. Today GK Solve share RRC Railway Group D 2017-18 Exams pattern and syllabus pdf file for you. You can download the pdf file just one click and free of cost.Download pdf link and details are given below. Exams pattern and syllabus are most important for every student. For better results in the examination, you know the syllabus of particular examination and daily practice. Most of the students are the failure in the examination for there proper Guidance. So first, you should know about Exam syllabus and then start practice. So Readers are requested to download RRC Railway Group D examination 2017-18 exam syllabus and pattern below.